DDD Pool Game - Download and Play Free Version! Easy to Learn and True 3D - Great for Beginners and Pool Sharks Alike! This game is pool at its finest, so step into this realistic 3D world and get ready to be addicted to DDD Pool. With easy controls, detailed graphics and custom game-play, you can't pass up this opportunity to become a pool legend from the comfort of you own home. 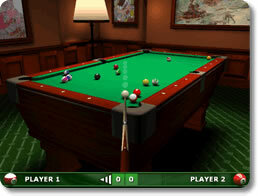 DDD Pool is the game to play for the inexperienced beginner or experienced pool pro and can improve its players' games in real life. You can almost smell the chalk and feel the felt with the detailed, bright 3D graphics that make you feel like you're in a billiards room. DDD Pool provides the sounds and visual effects that virtually put you on the table. The realistic ball and table physics make playing DDD Pool all the more authentic. 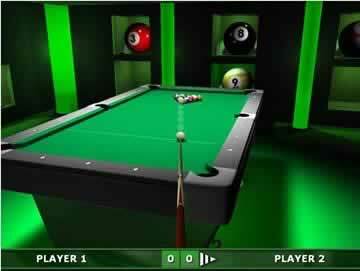 Play now with 3 difficulty settings on any of the 5 billiards games and you can pick exactly what you want to play. DDD Pool practice mode is perfect for beginners while the experienced player can compete in traditional 8-ball and 9-ball games or 8 or 9-ball challenges. 8-ball Challenge makes you sink 14 yellow balls and then the 8 ball in as little time as possible. You're given a 15 second penalty every time you commit a foul. And the 9-ball Challenge is similar, but you try to sink the 9-ball in as little time as possible while needing to hit the lowest number ball on the table first. DDD Pool is easy for anyone to play. Its simplistic controls allow stress-free pool controlled by keyboard or mouse. Even an inexperienced player can feel like a pro when you change the angle of your cue (SHIFT+mouse) and the cue tip position on the ball (CTRL+mouse) to add English or spin to your shots. You can even zoom in or out as far as you want to get a better feel for the table making DDD Pool much more user-friendly than other pool sims. You can hit the pool hall without leaving your house. Play as much as you want against all the various challengers. Once you master the A.I., play against your friends or family in the human vs. human modes. Young players can experience real billiards without having to sneak into a bar or pool hall. And older players can play from their most comfortable chair at home. DDD Pool is perfect for anyone. In practice mode you beginners out there can pick up the cue ball and move it to any location on the table. This makes it easier to clear the table and practice the shots you need most help with. Even pool professionals need to practice some time. In practice mode you experienced players can set up interesting or difficult shots that you might otherwise see only rarely. A newbie can turn into a pro in no time with the simple maneuverability of the cue ball in practice mode. 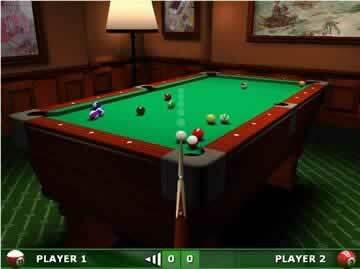 If you want turn into a pool pro from your home computer, enjoy an easy and realistic pool sim, avoid the crowded pool halls or go without buying an expensive table, download DDD Pool now!